Quick tip: it pays to check your training plan every once in a while. Last night I assumed I had my usual Tuesday 8 tempo miles to run, but as it turns out, this week I only have to do 5; I'm assuming because I have 19-20 miles to do Saturday. So that meant I got to sleep in and go to the gym! I usually don't get to go on Tuesdays. I can't decide which I liked more. After sleeping all the way till 7 (yep that's "sleeping in"), I woke up and got ready and checked my phone. I really do love the memories Facebook shares. Today I had a couple pictures that made my heart kind of ache about how fast Kennedy's growing up. Kennedy looks so darn pretty in this one. Her hair is simply amazing. 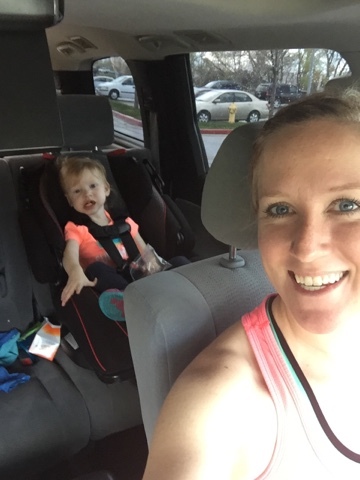 After we dropped off K (<---- I need to stop naming my kids with such long names to type) at school we hit the gym. The dead lifts kind of killed me off. I thought about snapping some photos to blog about what this place is all about, but forgot once the workout started. I will try and get that done. Then we waited to pick up K from school while a random rainstorm came through and dumped quite a bit of rain while everywhere else was sunny. 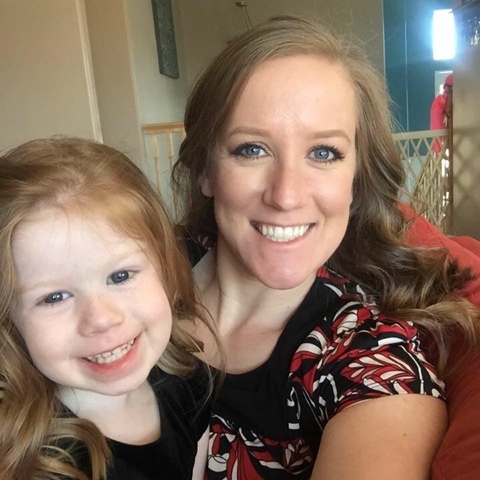 Brynlie is really good at saying "cheese!" when I pull the camera out, but her grin is always so funny! It's kind of impressive some days the ways she contorts her face. 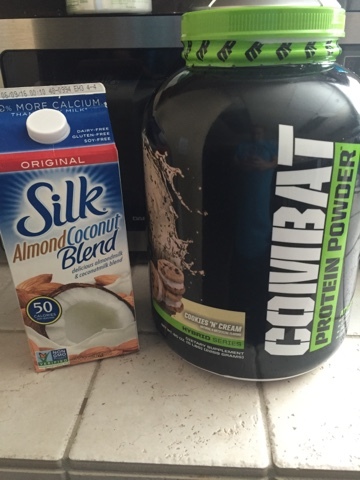 I made a quick stop at home and whipped up a protein shake to take to work. I tried this combo today with a big handful of ice and it was actually pretty good! It's not something I'll crave, like my amazing chocolate and peanut butter protein shake, but it's also not something I have to choke down. It didn't have a gross after-taste either, which was obviously super appreciated. Calories 260, fat 6g, carbs 12.5g, and protein 38g. I always buy unsweetened almond milk, but figured trying it with sweetened stuff first would be best. And it was. So I think I'll stick with this combo together and unsweetened in my regular shakes. In case you were drying to know. After work it was nap time, which meant treadmill time for myself. 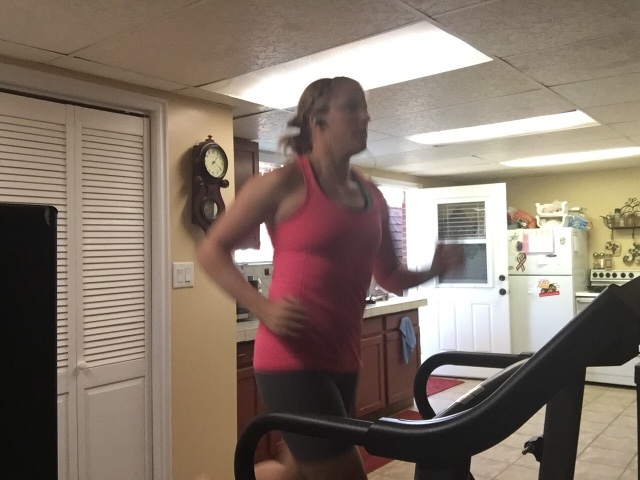 I can't tell you how stupid I felt doing a self-timer treadmill selfie, even though no one was there to watch me. I feel like if I'm going to be serious about this blogging stuff, I need to get used to it. 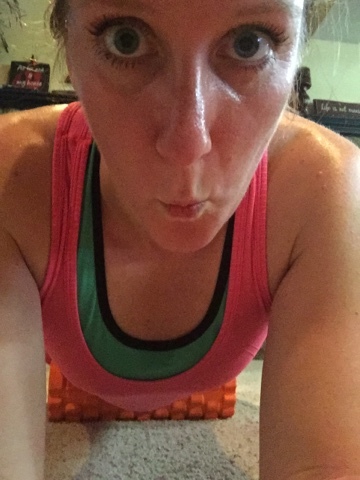 5 tempo miles left me REALLY sweaty! Or I guess I should say, I was really gistlening, because girls don't sweat, we glisten. This run was also super tough today. 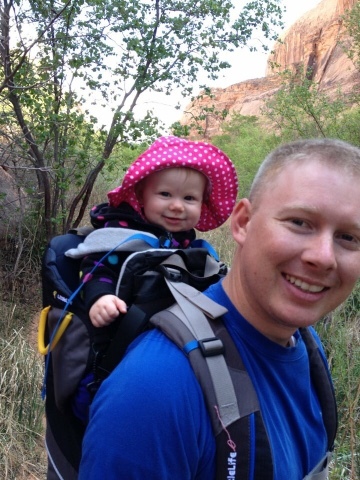 I have a few friends who are fairly new to running and get really discouraged when they have hard runs. We all have them. Just remember not every day can be perfect. Some days we will have great runs/workouts where we leave feeling on top of the world, and others where we feel like the world swallowed us whole. What matters is that you don't give up. With practice, I feel like it gets a little easier to accept the hard days and to train yourself to keep going even when you feel like you'd rather be punched in the throat. I had a rough week last week at the gym. I was tired and just struggled to really challenge myself. Don't let those times get you down. Keep going! You've got this! Each day is a new start. 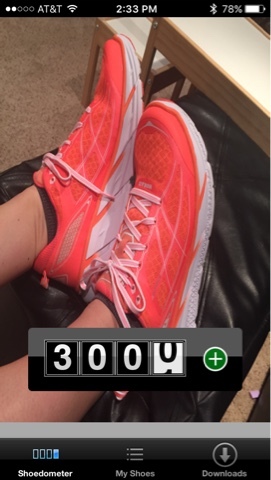 Random note: I hit 300 miles on my shoes today. 300 miles in 3.5 months. I finally showered at 3:00 p.m. and then devoured a huge salad in about 5 minutes. Some days, salads are just amazing. Especially with lots of crunchy things in them. 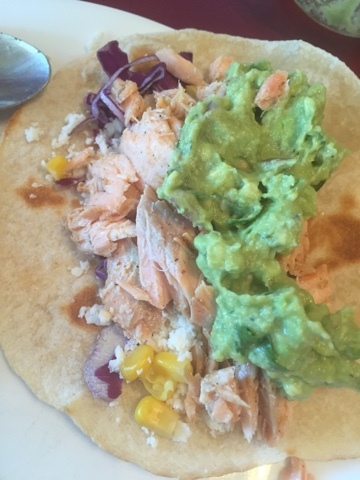 For dinner tonight I decided to try making salmon tacos. I'd never had one before, much less made one, but they were super yummy, even though it looks like puréed baby food in a tortilla. And bonus, my hands still smell like fish! Every girls dream! And can we have a moment of silence for how fantastic avocados are? 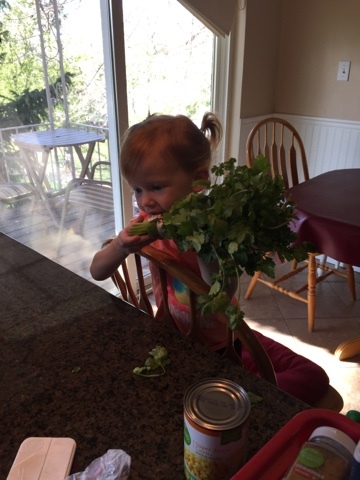 Brynlie just wanted to snack on the cilantro. 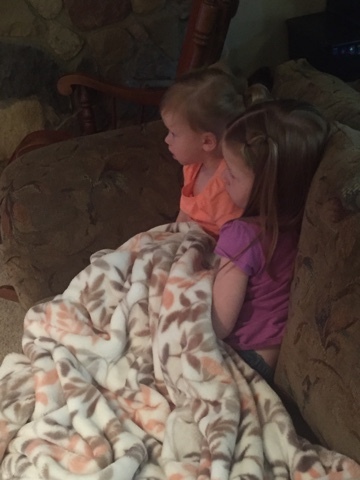 I was folding clothes tonight and came out of my bedroom and saw that Kennedy had started Harry Potter yet again, and her and Brynlie were snuggled up together watching it. It's moments like these where I feel so much love for them I can't even put it into words. It's so sweet! Kennedy was gone all day at school and hanging out with Aunt Hillary and I think they missed each other. 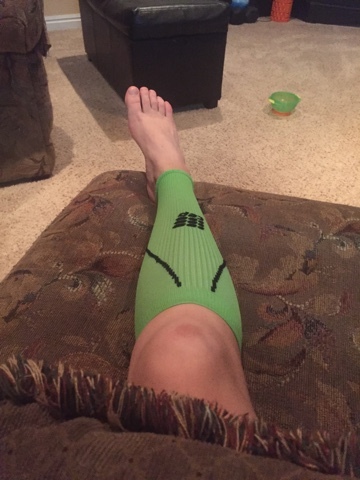 My calf has been feeling sore so I'm hoping this helps. We have our couples massage tomorrow, so I'm sure that'll help things. I can't wait! !